As the snow melts and buds begin to blossom, couples looking for a romantic getaway laced with culture should consider a weekend in New York City, Philadelphia or Washington, D.C. Each city has a museum hosting an exhibit with ties to romance – from truly spectacular jewels to paintings of two cities eternally linked with amor and amore. Glittering NYC: Prepare to be dazzled at “Set in Style: The Jewelry of Van Cleef & Arpels” (February 18 through June 5) at the Smithsonian Cooper-Hewitt, National Design Museum (www.cooperhewitt.org) in New York City. As you wander among more than 350 truly stunning works created by the jewelry maker since its 1906 debut in Paris, divided into six themes – Innovation, Transformation, Nature, Exoticism, Fashion, and Personalities – you’ll be awed by the technique and imagination (not to mention the money) required to create them. Among the pieces you’ll ogle: a 1937 “Peony” brooch with exquisite “mystery-set” rubies (shown above at left, courtesy of the Smithsonian Cooper-Hewitt, National Design Museum); a 1971 bird brooch with a 95-carat yellow diamond suspended from the beak; and dazzling baubles owned by Elizabeth Taylor, Princess Grace, Eva Peron, Marlene Dietrich and Jacqueline Kennedy Onassis. La Dolce D.C.: There’s more than just a romantic exhibit in Washington, D.C., this spring. The entire city has gone, well, a little Italian to honor the 150th anniversary of the unification of Italy. Here’s what’s happening: The National Gallery of Art (www.nga.gov) presents “Venice: Canaletto and His Rivals,” featuring 50 cityscapes by the lagoon-laced city’s most important 18th-century painters (February 20 through May 30). 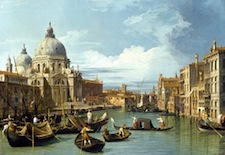 Landmarks featured include Piazza San Marco, the Rialto Bridge and the Grand Canal (shown at right, courtesy of the National Gallery of Art). Complementing the Canalettos, the city’s La Dolce D.C. promotion (March 1 through July 31) will highlight DC’s Italian connection in art, music, dance, fashion, film, food and wine. In addition to the National Gallery’s exhibit, The Phillips Collection (www.phillipscollection.org) will present nearly 40 paintings by Philip Guston, the former artist-in-residence at the American Academy in Rome (February 12 through May 15) and the Washington National Opera (www.dc-opera.org) will stage Puccini’s Madama Butterfly (Feb 26 through March 19) and Donizetti’s Don Pasquale (May 13 through 27). And because a celebration of Italy would be nothing without food, the National Gallery is transforming one of its eateries into Garden Café Italia, serving classic and contemporary Italian fare by chef Fabio Trabocchi. Tip: Time your visit from March 26 through April 10, and you’ll enjoy the added romance of the 99th annual National Cherry Blossom Festival (www.nationalcherryblossomfestival.org), where the focus is on the fluttery pink halo of cherry blossoms that surrounds the Tidal Basin. With Love, Philadelphia XOXO: There’s also a focus on romance in Philadelphia, which has been pitching its spring offerings via its “With Love, Philadelphia XOXO” campaign highlighting the city’s most romantic aspects. Holding court at the Philadelphia Museum of Art (www.philamuseum.org) is “Paris Through the Window: Marc Chagall and His Circle” (March 1 through July 10), which features 70 works by artists from around the globe who descended on the City of Light to live and paint in the early 1900s. Visit from March 6 through 13 and you can also peruse the fragrant exhibits at the Philadelphia International Flower Show. See our New York City Travel Guide, Washington, D.C. Travel Guide, and Philadelphia Travel Guide for more trip-planning information, then use our Travel Search price comparison tool to find the lowest rates on airfare, hotels, packages, and more.